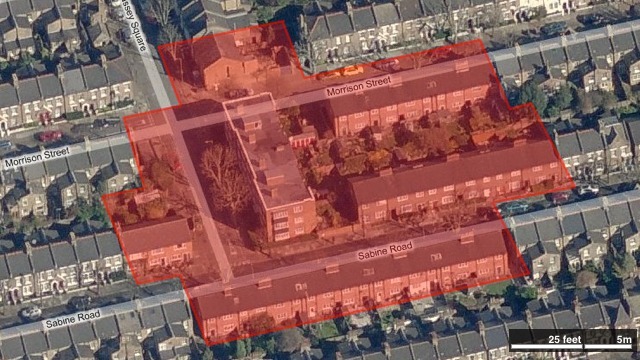 The extent of destruction: The red area highlights the homes destroyed or damaged beyond repair. There is an immediacy to reading the reports compiled while various authorities were responding to Second World War bombing. As I noted when writing about the houses a few doors down from me, records of incidents are mainly as it happened notes of orders and instructions given rather than post-incident reports written with the benefit of hindsight. Given a little thought it is obvious this is the only way it could be, the sheer scale of the Blitz meant that there would be little time for reflection and report writing; the focus was on clearing up from one raid, recovering and preparing for the next. The result is that the slips of paper, collated and bound together during the war, read almost like a rolling news channel: information is constantly coming in, things are happening, the situation changes, but as you read through you realise that you aren’t analysing or taking an overview – you are caught up in it. By July 1944 Allied troops were in northern France, pushing the German troops back and the Blitz a three-year old memory. However, just over a month earlier Germany had launched its first V1, the ‘flying-bomb’, ‘buzz-bomb’ or ‘doodlebug’. The device was relatively simple. A bomb with a jet strapped to it, pointed towards London and, when flying, the air flow turned a small propeller that operated a counter, when the counter reached zero it triggered a dive (which often also cut out the engine) and the bomb fell to earth. Incident 1038 records the bomb that impacted in the rear garden of 2 Brassey Square. The picture illustrates the scale of damage caused (you can see the original on Bing maps, and look at it from various angles), over 100 houses were destroyed by the bomb itself, or damaged so badly that they were later demolished. If you know the area you will realise that it’s almost impossible to get a photo at ground level that gives any indication of the scale of the damage. The “fly dropped” at 0628, it was reported at 0634 and by 0635 five ambulances were despatched, along with the warning that “Bolingbroke Hospital is full up”. At the same time various mobile units mobilised to help with the clear-up and rest centres alerted and told to expect up to 200 people. Status reports sent up the command chain feared heavy casualties. Fifteen minutes after the first ambulances were sent a further seven were requested, all being told to approach via Grayshott Road (other ways being blocked), and neighbouring areas were contacted to request ambulance reinforcements. Along with the ambulances eleven rescue parties were sent (these were divided into ‘heavy’ and ‘light’, depending on the size of the incident, in this case it seems they just sent everyone!) along with a heavy mobile unit and mobile command unit. And then, almost as suddenly as it happened, calm descended. The flurry of messages slowed and as the people on the ground tackled the situation. By 0818, less than two hours after the impact, an update recording that work was progressing, two were killed, three were still trapped, thirty-two taken to hospital plus a further ten minor casualties: “job well in hand.” As a consequence the ambulance reinforcements borrowed from Wandsworth (then a separate borough) were returned. The messages show a well-rehearsed procedure being acted out, with various actors arriving on the stage, doing their jobs then leaving. Some would have been more welcome than others, at 0740 word was received that the Ministry of Food would be sending a food van, which duly arrived at 0815. But at 0800 and 0915 the mortuary van arrived, each time to take away two bodies. At 0859 it was believed all trapped people had been rescued and the ambulances returned to their stations: the only slight drama was at 1014 when a heavy rescue party was requested as “two persons still trapped.” It arrived at 1022 and, after half-an-hour, it was realised that the fears of people still trapped where unfounded. All persons accounted for. Incident closed. Subsequent Mr Hockley was found in an Anderson shelter to the rear of 2 Brassey Square, making five killed in all. Of the forty-four taken to hospital twenty-five were categorised as ‘stretchers’, nineteen as minor casualties. I’ve not been able to find any further records of them, which means they are likely to have survived this incident. Obviously I need to thank the staff of the local history section in Battersea Library for this, but I’m not the only one extending thanks. While I said there didn’t seem to be any form of post-incident reflection during the Blitz, it was a little different on this occasion, perhaps the relative infrequency of V1 and V2 incidents allowed more time, and the records also contain a private report of the incident from the incident officers, E Witton and HS Phillips who were based at Basnett Road school (Basnett Road barely exists now, just a stump on Lavender Hill with the rest demolished to make way for the Ashley Crescent and Wycliffe Road estates, the old school would be near the current John Burns school). They use their report to thank all involved in the rescue but single out three individuals: two wardens – W Ben and R Clarke, who climbed in through the debris to rescue trapped people, at risk to themselves – and Mr Wheeler, who sent to boxes of cherries to be distributed amongst the bombed-out children. James, thank you so much for the info you have researched here and previously. I showed my Dad the above account, he remembers Mr Wheeler as being the greengrocer from cnr Wickersley Road and Lavender Hill (when they used to meet). The food vans mentioned catered for the Wardens and the rescuers, the Salvation Army supplied food and tea to the residents. Dear James, my father and his brother were actually buried in this bombing. It is a bit of a family legend but they lived in Brassey Square and my father remembers being buried. His name was Geoffrey Jones and his brother was Peter Hughes. Their mother was Lavinia Hughes. I am so grateful to you for posting this. My father believes that he was actually involved in another bombing when he was a baby; he was born on 15th October 1938 and thinks that he was only 12-18 months when this happened. If you could shed any light on an earlier incident that would be amazing. My Father’s brother, Peter Hughes, still lives on the Shaftesbury Estate in Ashbury Road. Excellent piece of research and brilliant write up. I have also studied the war time incident reports at Lavender Hill local studies department on areas familiar to myself. Have you written any similar articles?